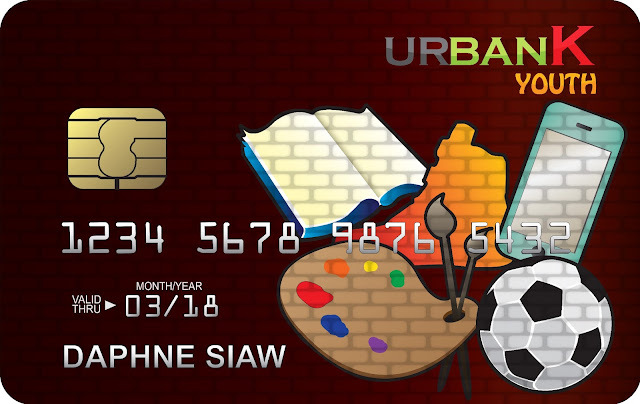 Here’s my entry for Nuffnang’s Youth Credit Card Design Contest! I used bright colors on the design because as a youth myself, I’d love an energetic card with a pop of color to stand out from all the other cards in my wallet! I’ve also always loved the unexpected eye-catching creativity and context of graffiti art done by youths in cities, that I just had to use it as the design concept! The items on the card shows some things that youths need in our lives as we grow up. The youth credit card is a great companion and support for us to purchase things we need to do things we love and nurture these interests while we are still young and have the time to. As long as we handle the card with ‘care’, of course. Name of the bank is URBANK, UR BANK for URBAN K-ids, geddit? geddit? Nevermind. And the card’s awesome name will be………………..
URBAN Kard! Makes a good tag line, no?